I have to confess, that before I started writing product reviews on Dotty’s Blog, Poppy’s accessory selection was fairly limited. 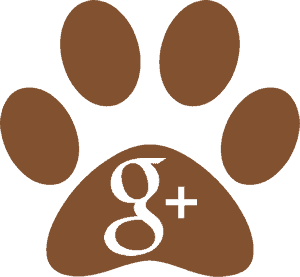 [In fact shameful by today’s standards!] 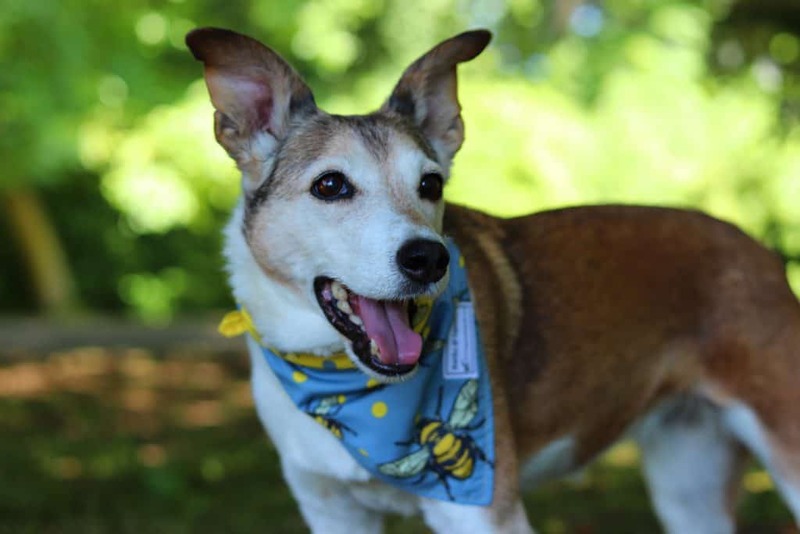 I’ve always been of the belief that dogs, given the choice, would prefer your company rather than oodles of cash being spent on them; and plus, twelve years ago when Pops was a pup, there really weren’t the products available for our canine companions that there are now. 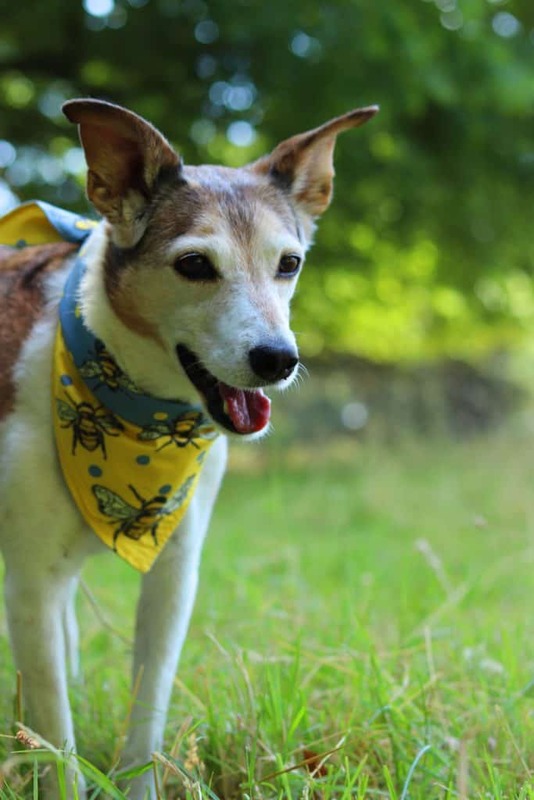 However, these days Poppy’s pawdrobe is rather impressive – in fact she boasts more collars than I do necklaces, and more bandanas than I do scarves!! And, as you may have noticed, she most definitely doesn’t object to posing for the photos! 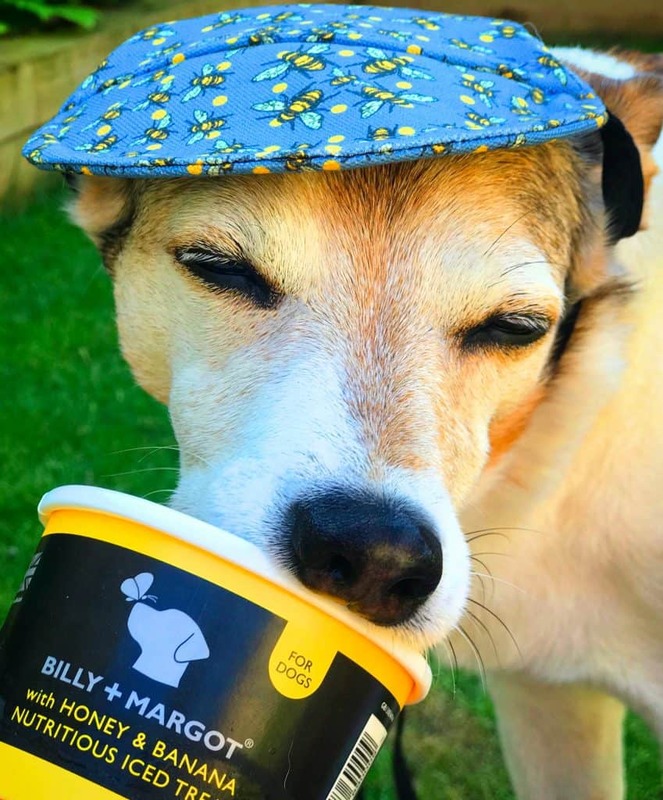 So when we were asked by the lovely Joanna, owner of Barks and Squeaks, to put some of her products to the test I naturally jumped at the chance, whilst Poppy instantly started to strike a pose! 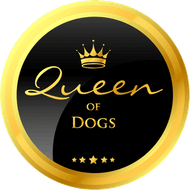 The doggy market is saturated with dog accessories, and whilst it’s lovely to have the choice, products vary in quality a lot in my experience; and a bit like with fashion for us humans, the price doesn’t always reflect the quality you receive, particularly when you’re purchasing online. 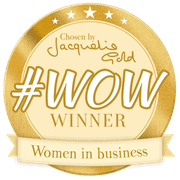 With Barks and Squeaks, however, you can expect products of the finest calibre – every little detail has been carefully considered and designed with practicality in mind to withstand all those fun-packed doggy day’s out. 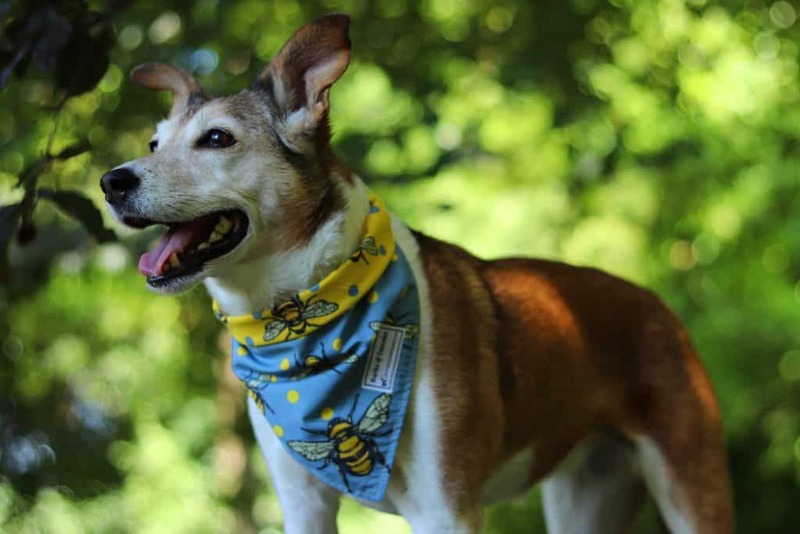 The Barks and Squeaks bandanas come in a range of eleven different designs, all of which are fun, vibrant in colour, and guaranteed to turn heads when you’re out and about; so, as you can imagine, I had quite a job to choose which design to go for! 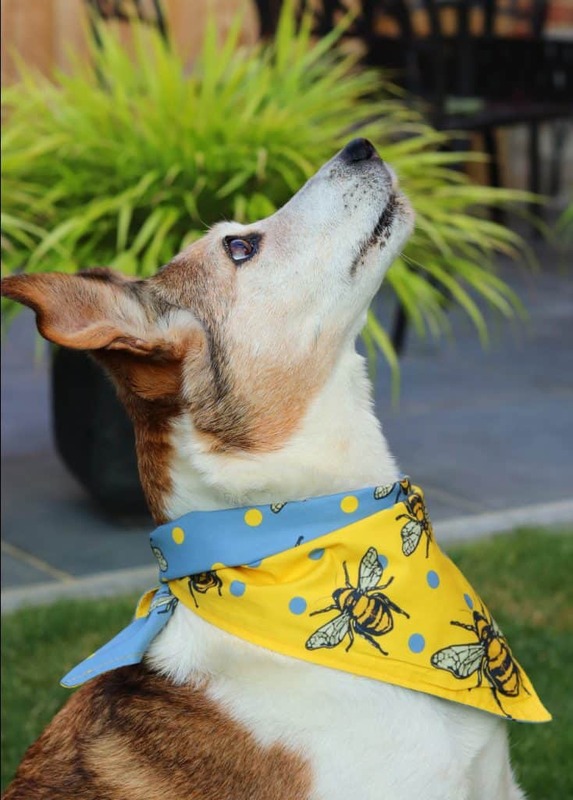 However, I just loved the colours in the bee fabric that chose – perfectly fitting for this gorgeous weather we’re experiencing here in the UK at the moment, and a little ironic too as Poppy is absolutely petrified of anything ‘buzzing,’ after having been stung by a bee a few years ago – she never forgets! 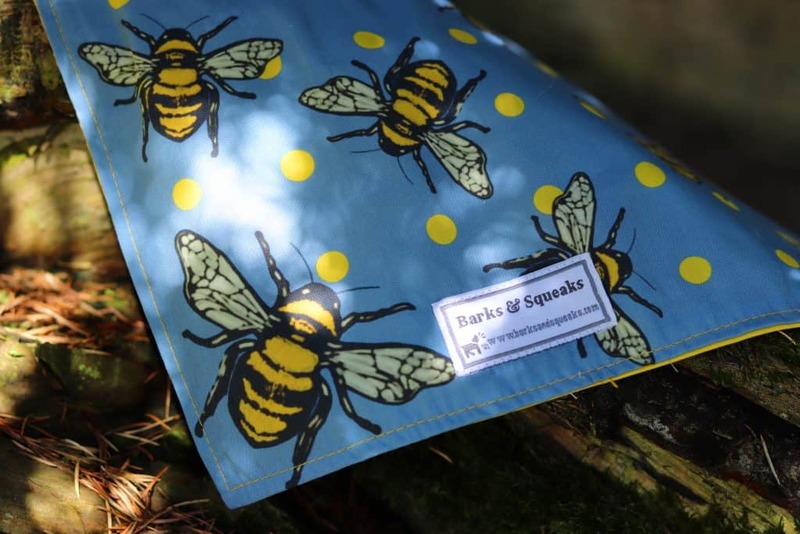 All the bananas in the Barks and Squeaks range are reversible, which is such a bonus as you feel like you’re getting two bandanas for the price of one. It also means the fabric is double the thickness so it doesn’t crease as easily when being worn. 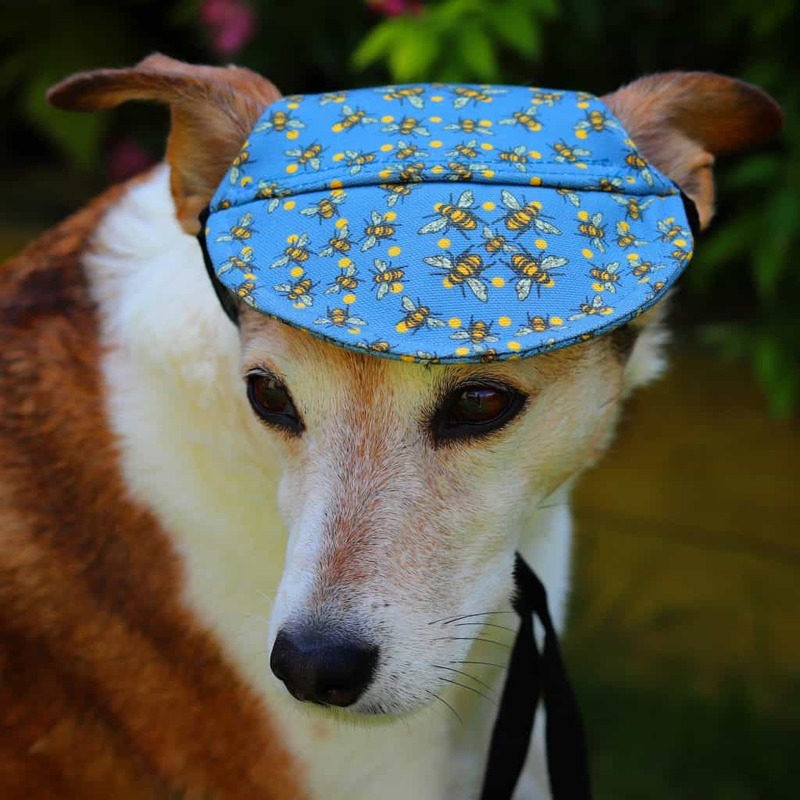 In addition you can fold the top edge to adjust the length and to give a contrasting edge – just what you need for the stylish pup. 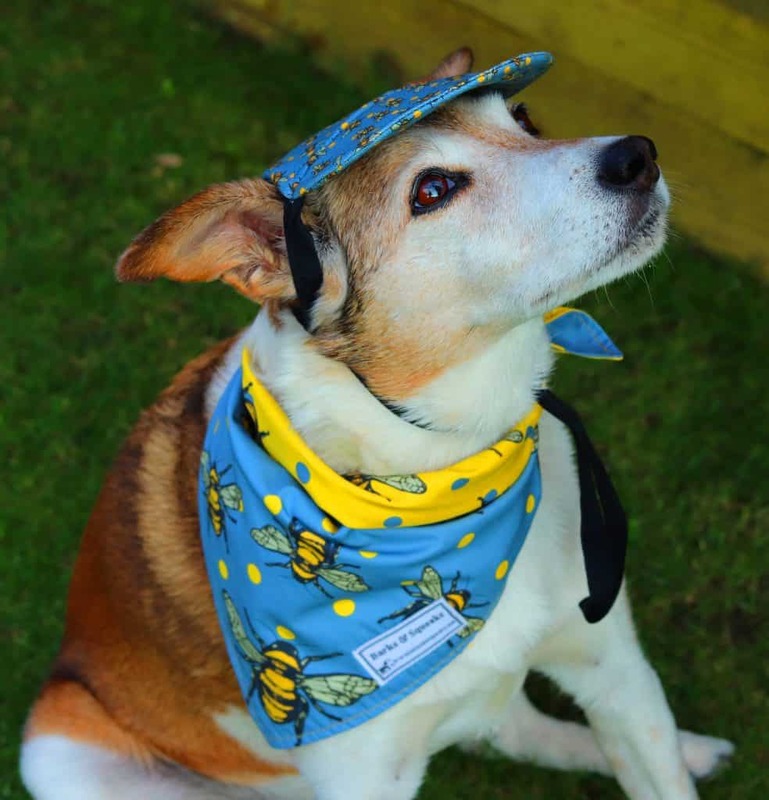 The bandanas come in a choice of four sizes and range in price from £8 – £14, very reasonable for such a high quality product which is so beautifully stitched and finished off with a crisp, clean label bearing the Barks and Squeaks logo. 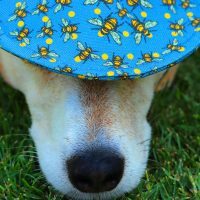 Now I have to admit, I’ve never really come across doggy caps until this year, when I’ve noticed a few trendy pupsters parading in them at country shows and the like. I rather had my reservations about how Pops may react to having something on her head! Don’t get me wrong, in this glorious heatwave they keep the sun off those precious furry heads and are a sensible idea (providing you don’t see it as a licence to take your dog out in the scorching sun – even a self-confessed sun worshipper like me is resigned to the shade at the moment, so we really must consider our pups), but I was rather anticipating Pops may shake it straight off, given her terrier temperament!! 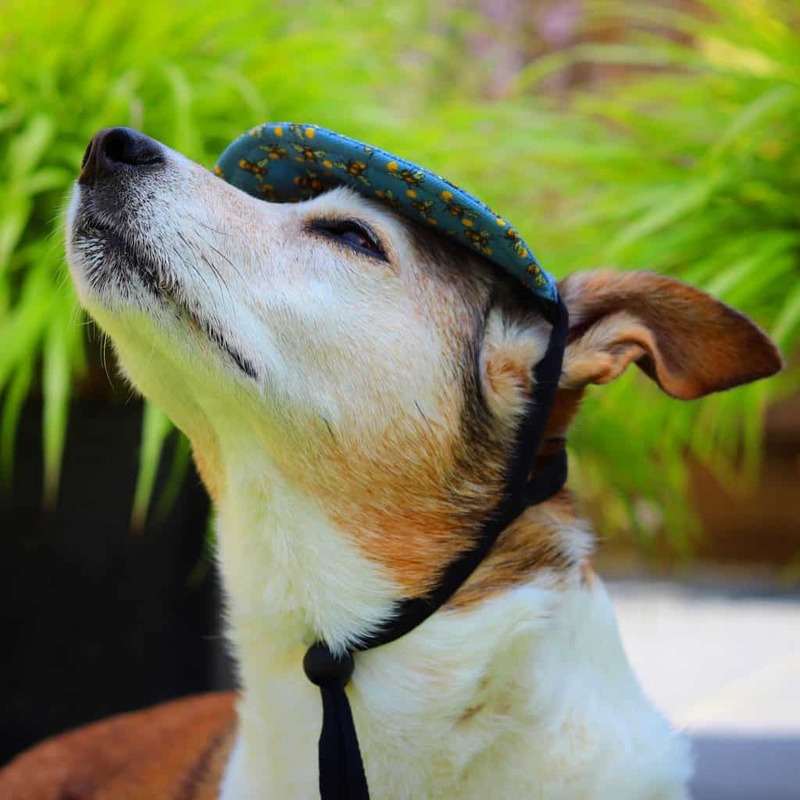 However, true to form, Pops does like to pose, and so was quite happy parading around in her new stylish cap! Just like the bandana, the hat is so beautifully made. With a little peak that you can flex into position, neat little loops that fit over the ears and an adjustable strap that fastens in place using a toggle (much like you’d find on a rain mac) so you can modify it to be the perfect fit. 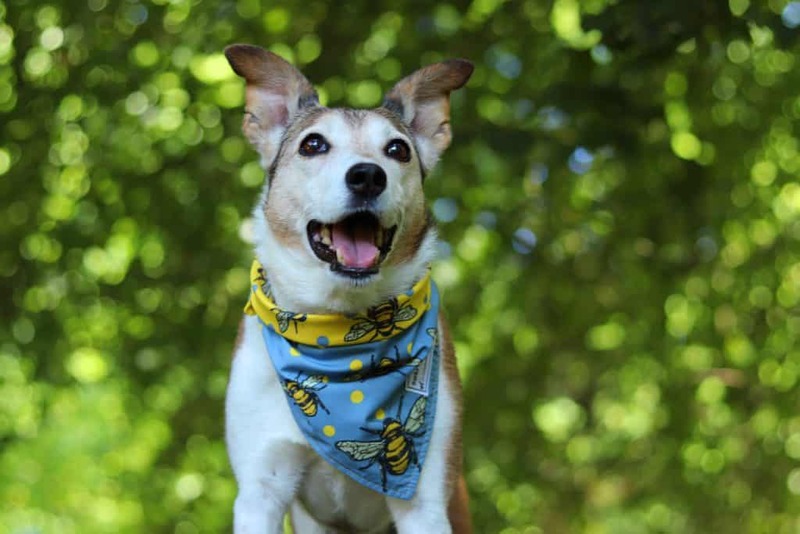 The caps come in three sizes and eleven gorgeous designs, which coordinate with the Barks and Squeaks original bandana range, and priced at just £12 they make a stylish addition to finest of pawdrobes. 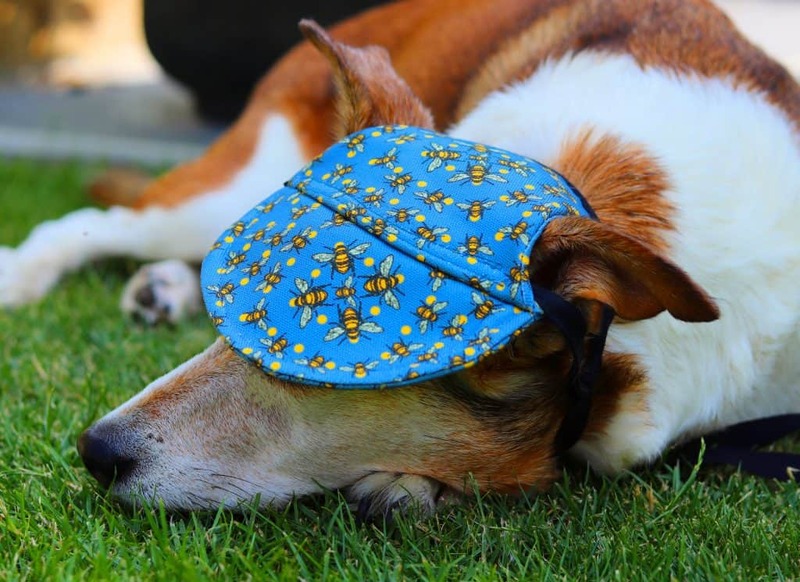 So if you’re looking to make the cutest of statements when you’re out and about this Summer, these really are the thing, plus, they do a fab job of protecting your dog’s eyes from the sun. 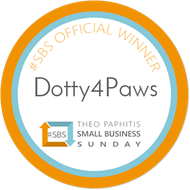 What’s more, as a Dotty4Paws customer, you can enjoy a cheeky 10% discount off their products using the code DOTTY10. 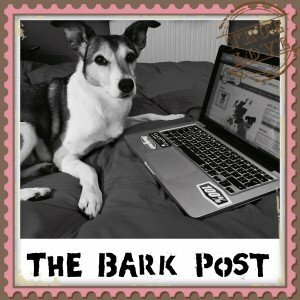 We’ve thoroughly fallen in love with Barks and Squeaks, and it’s definitely going to be one of my go-to places for doggy presents in the future. 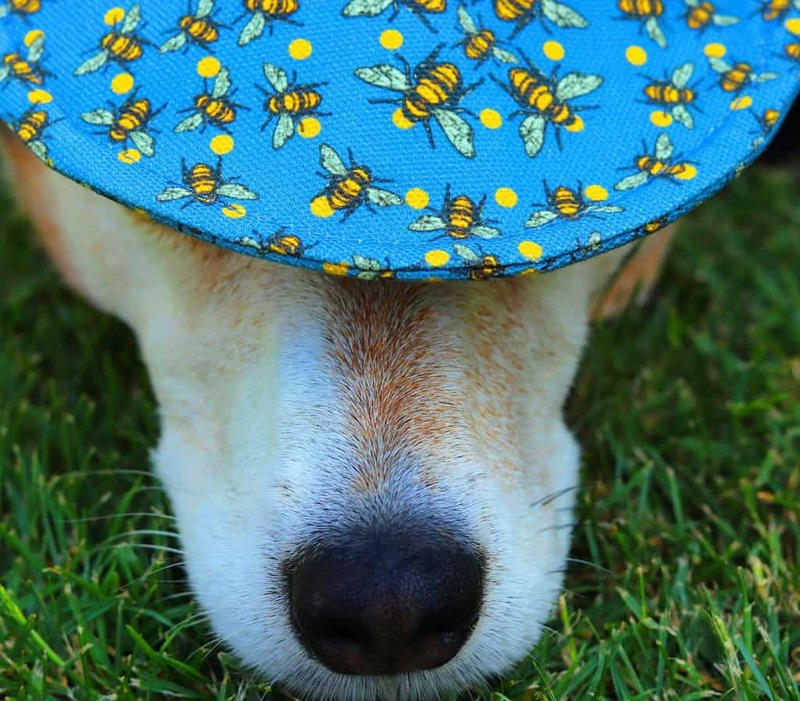 If somebody special in your life has something the celebrate, I can almost guarantee that you’ll be able to find the pawfect gift amongst their carefully curated range of doggy-related delights. 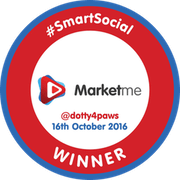 Check out their website today and be sure to tag us in your photos using the hashtag #dogslovedotty if you decide to treat your pup. 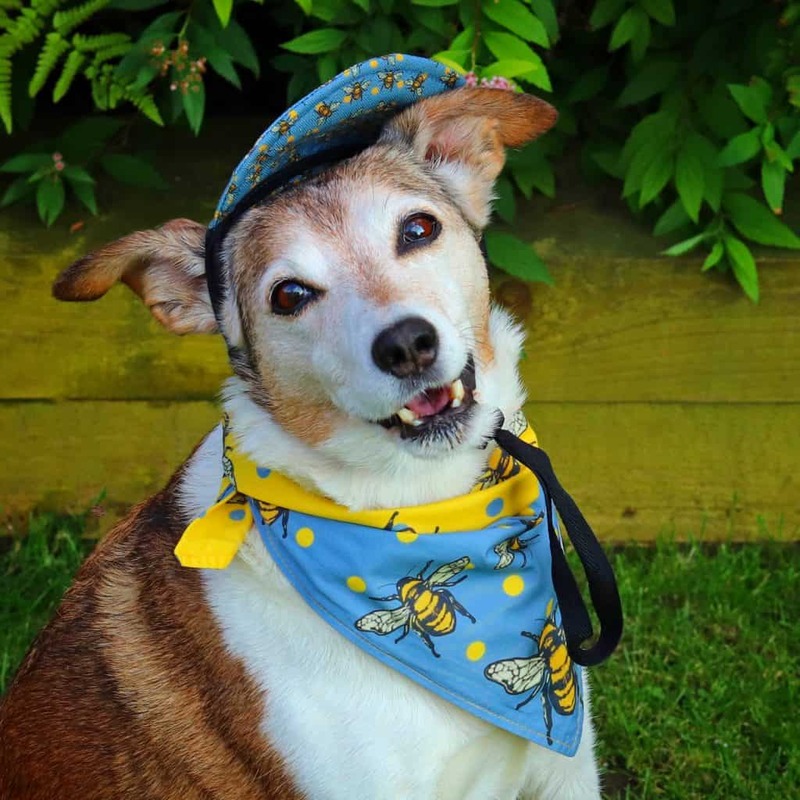 A huge thank you to Joanna for letting Poppy-dog model your beautiful products – she’ll wear them with pride.